Today in Sunday School Gregory learned about Noah’s Ark and couldn’t help imagining what Noah and everyone was up to once they were on dry land again, and the only people left on earth. 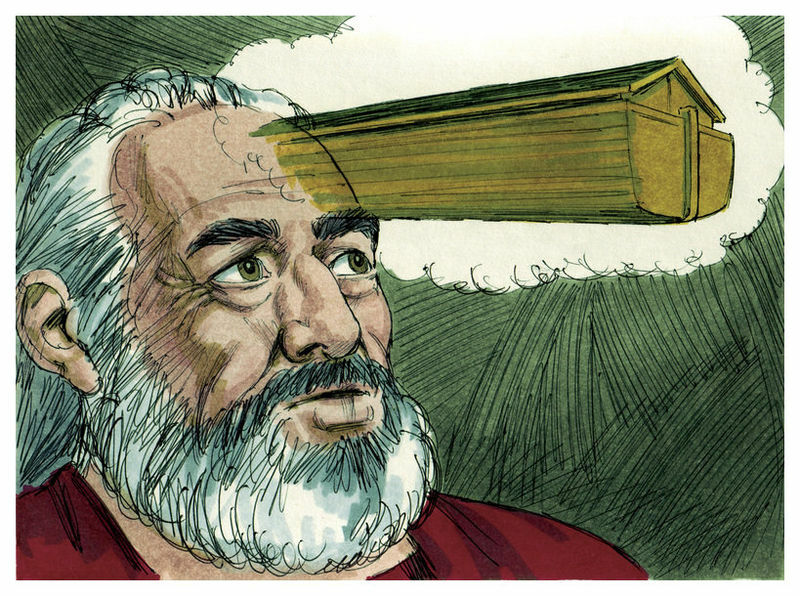 In last week’s lesson, God turned on the heavenly hose full blast until everything that breathed couldn’t breath anymore, and all the bad people on earth became dead, except for God’s favorite man, Noah, who built an ark etc. etc. (See Old MacDonald’s Farm for more information). When God finally pulled the plug on the deluge, Noah was 601 years old even though Noah didn’t look a day over 500 and could still touch his toes! 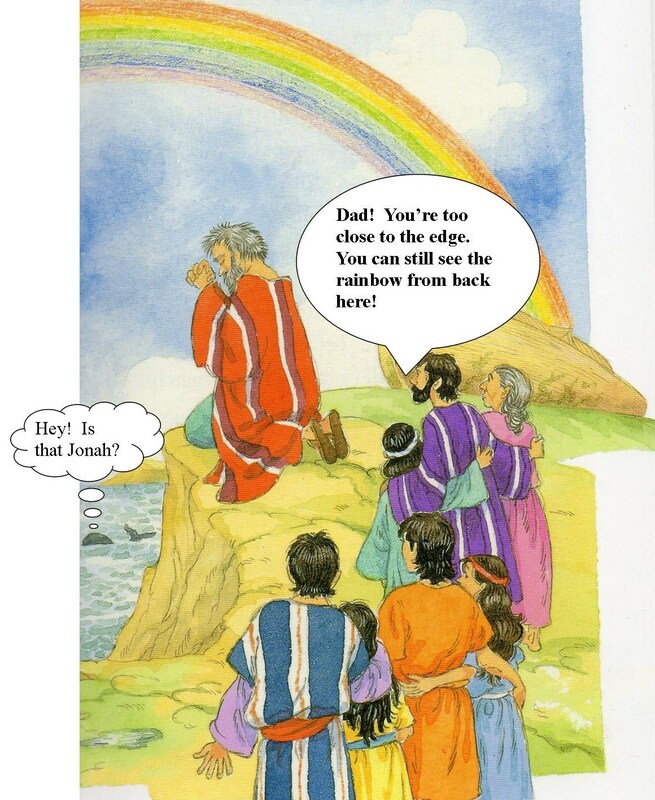 While Noah’s wife and Noah’s three sons Ham, Shem and Japheth and their kids enjoyed sifting through the flood debris for cool stuff, Noah spent most of the time moping in his tent and picking the mud off his robe. 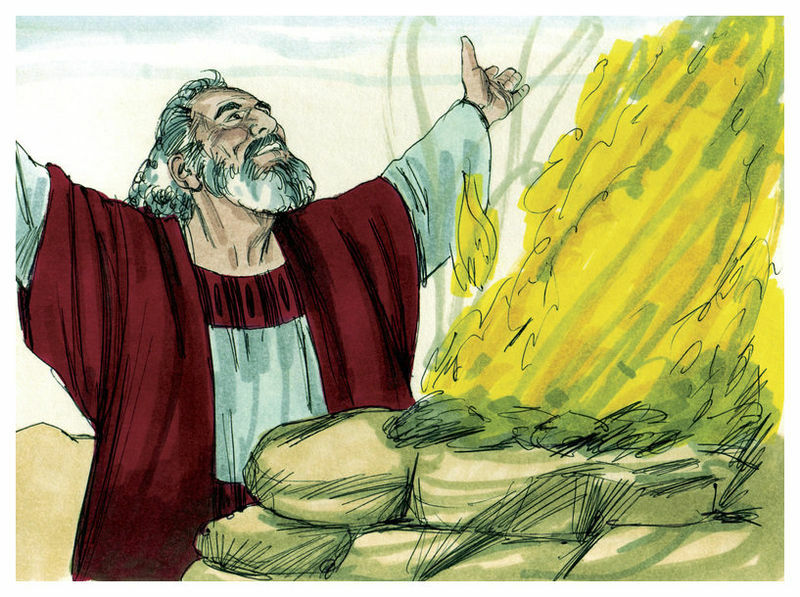 Occasionally Noah would schlep through the flood debris to the barbecue/altar to fix the Lord and (and himself) a Shem burger invented by his son Shem (his son Ham was too lazy to invent anything). Betty: Noah, you really need to stop laying around all day kvetching. Noah: There’s nothing else to do. I hate this place, it’s so boring! Betty: How can you say that when there’s so much debris out there just waiting to be sifted through. Look what I found just today? Betty: An apple with one bite out of it! Betty: Listen, Noah why don’t you start on a project. Do something constructive. You’re a farmer. Maybe you could plant something. Noah: Hey that’s a swell idea, Betty. I’ll plant a vineyard! Betty: A vineyard? But we don’t drink. I don’t think the Lord would approve of that, Noah. Noah: Oh no! Not for wine . . .
Noah: Oh you know, for raisin bran, raisin cookies, Waldorf salads . . .
Betty: I don’t like raisins in salad. Noah: Okay, whatever, you can pick the raisins out. The point is, Betty, what this place could use is a vineyard! Besides wine seeds are the only seeds I brought with. Betty: You mean grape seeds? Noah: Yeah, what’d I say? Betty: You said wine seeds. Noah: Whoops. Slip of the tongue. Noah: Betty, I’m 601 years old for god sakes, cut me some slack! Betty: Noah? What are you drinking? 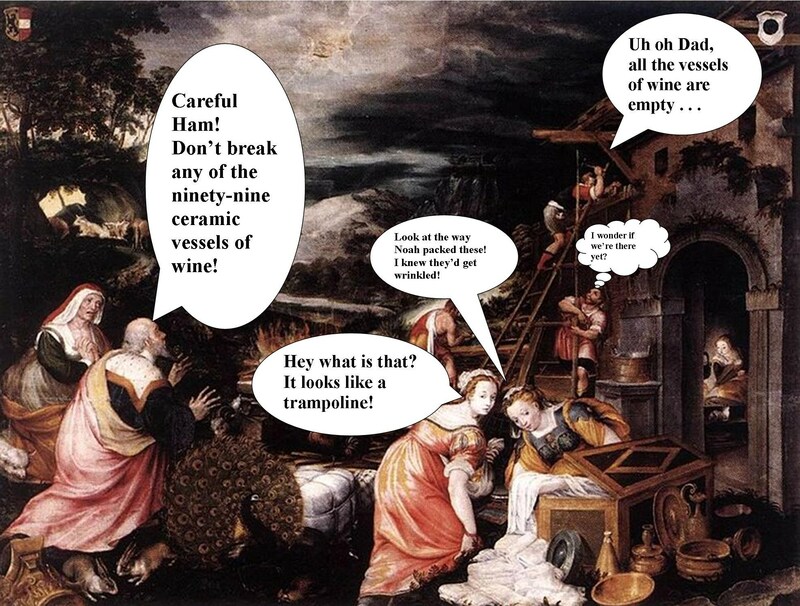 Noah: Just some . . .hic . . . grape juice. Shem: Hey has anybody seen, Dad? Ham: He got wasted and passed out in his tent buck naked! Ham: Oh you guys, stop being such prigs! 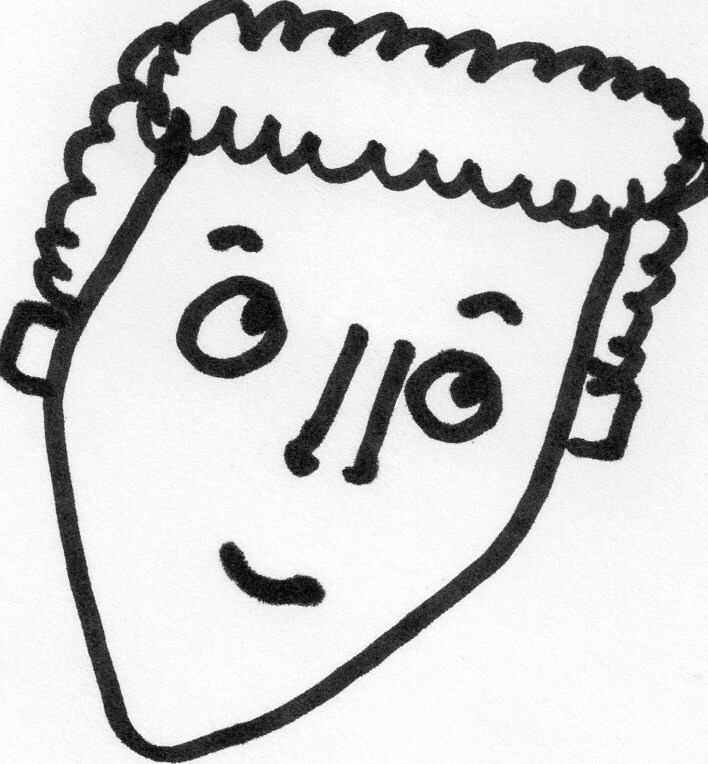 Japheth : We care about, Dad, okay? We’re not pigs, Okay? Ham: I didn’t say you were pigs, I said you were prigs. Ham: Listen Shem, I think I know what a pig is, I was named after one. Hello?! Jepeath: Come on Shem. Let’s go get a blanket to put over Dad’s buck nakedness. 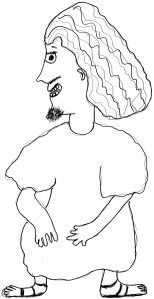 Japheth: It’s a robe without sleeves. You really need to keep up with technology better, Shem. Japheth: Dad’s awake and he wants to see you, Ham. Noah: I’m putting a curse on your son, Canaan! Noah: He will be a slave to his brothers. Give praise to the Lord the God of Shem! May God cause Japheth to increase!! 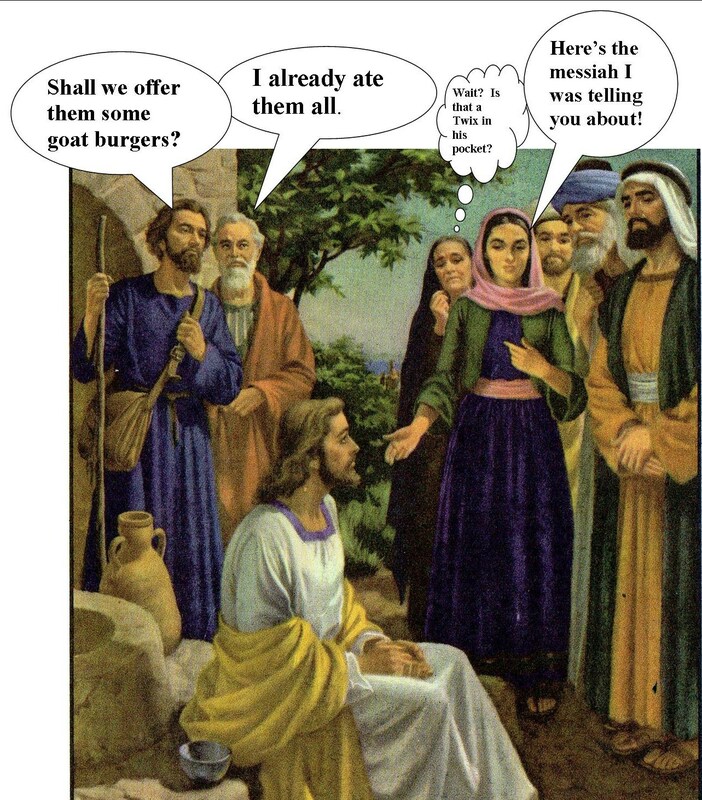 Ham: Well Japheth has been putting on weight but I just thought it was the Shem burgers. Noah: CANAAN WILL BE THE SLAVE OF SHEM! Ham: Okay Dad! I’m standing right here. There’s no need to shout. Please use your indoor voice. How about a nice cup of black coffee and a cold shower? Noah: AND HIS DESCENDANTS LIVE WITH THE PEOPLE OF SHEM! DO YOU HEAR KNOCKING? WHO SET MY CHEESE AFIRE? Ham: Okay Dad, now I know you’re still drunk. Afire is not even a word, is it? Noah: A CURSE ON CANAAN! Ham: But Dad, my son Canaan is just a little innocent boy who loves his grandpa. Noah: OKAY! MAKE THAT A CURSE ON CANADA! Ham: Consider it cursed! Go back to sleep, Dad. Noah: Okay, but wake me up when it’s time for soccer practice. And there you have it, Dear Readers. 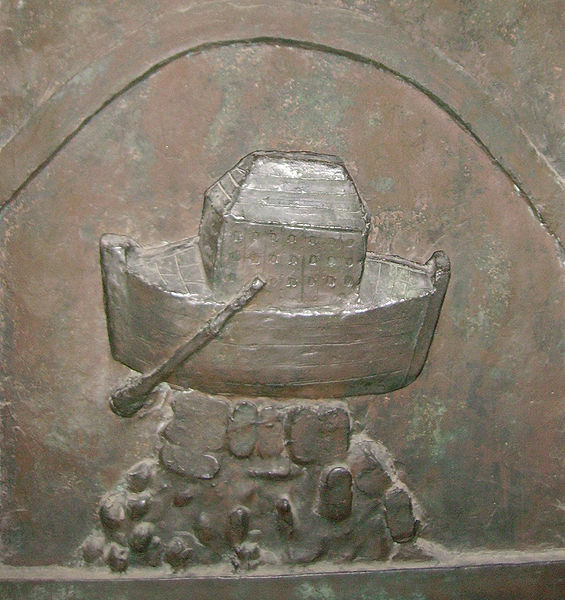 How Gregory imagines it was like after for Noah after the flood. Check back next week at this same time to find out what happens next. Noah thinks about cheese . . or Canada . . . or Canadian cheese . . . Welcome Dear Readers to this Sunday’s edition of Gregory’s Bible Stories. Today in Sunday School Gregory learned about Noah’s Ark and couldn’t help imagining what it must have been like stepping out on dry land after being stuck on the ark for so long. When Noah and his wife and his three sons, Shem, Ham and Japheth and their wives and two of every animal on earth had been stuck on the ark together so long no amount of Febreeze could have helped, Ham looked out the window and saw that all the water was gone, and the ark was high-centered on Mount Ararat. The date was January 1, قبل يسوع– wouldn’t you know! The one day everybody was hung over. Noah looked outside and saw that even though the sun was so bright it was giving him an even worse headache, the land was still pretty muddy so he made everybody stay inside the ark until the mud was complete gone on February 27, قبل يسوع because no one had remembered to bring their galoshes. When Noah was 601 years old. God told Noah to go ahead and let everybody out of the ark so that they could get started on reproducing and populating the earth again. Noah decided to keep it to himself that the male and female rats already had 473 kids. Why let the cat (both male and female) out of the bag? Noah figured it would just put God in another one of His Destroy-Every-Living-Thing funks. So to keep God in a good mood, the first thing Noah did when he got outside was build an altar to the Lord using an old boot, some broken pottery and other debris he found on the ground from the Destroying-Every- Living-Thing rubble that was strewn up one side of Mt. Ararat and down the other. Noah gathered one of each kind of ritually-cleaned animal and bird and burned them whole as a sacrifice to the altar. Then he took out a bottle of Noah’s Judgment Day Barbecue Sauce, he managed to smuggle in his robe — and poured it over the top. “Never again will I put the earth under a curse because of what man does; I know that from the time he is young his thoughts are evil. Never again will I destroy all living beings as I have done this time . . . as long as the world exists there will be a time for . . . etc . . . etc . . . ” (right about here is where the bible quit listening). Then God gave Noah a Thumbs Up/Thumbs Down list for mankind’s behavior since nobody remembered to pack the Ten Commandments. Then God promised not to destroy the earth with a flood ever ever again. He didn’t come right out and say He was sorry, but everyone suspected it. God went on to promise that every time a rainbow appeared in the sky, it would mean that God was keeping his promise to never wipe out mankind ever again with a flood so help Him Him. The bible tells us that Noah, Shem, Ham and Japheth were the ancestors of all the people on earth. Of course, the bible probably would have listed their wives as ancestors too — but they were girls. 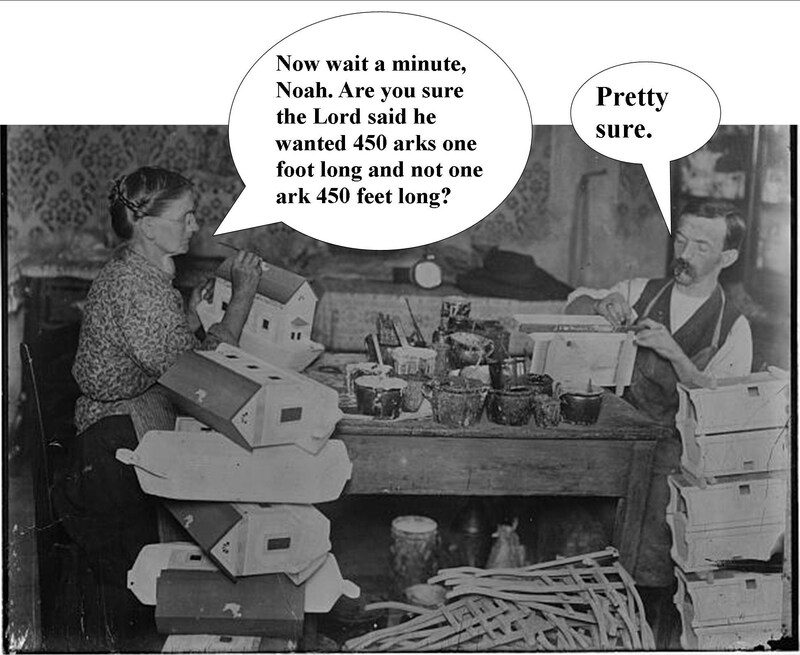 After that, everything was going swell in a hand basket for our little group of mankind, that is until Noah had to go and get the bright idea to plant a vineyard . . . and you don’t even want to know what happened next — but Gregory is going to tell you anyway — so check back next week, Dear Readers! Today in Sunday School Gregory learned about Noah’s Ark and couldn’t help imagining what it must have been like living on the Ark while waiting for the flood to subside. Noah: Honey! Come on! You’re not still packing are you? We’ve got to get going! The floodgates of the sky are opening! Noah’s Wife, Betty: I can’t get my bath robe to fit into this stupid suitcase! Noah: Here let me do it. Betty: Oh no you don’t! You’ll wrinkle everything! Noah: Honey! I just packed two of every kind of animal into one measly ark. I think I can pack a suitcase. Betty: Do you think we’ll have room for the trampoline? I’d like to stay in shape, God only knows how long we’ll be stuck on the ark. Noah: Sure you can bring the tambourine. You know how much I love to sing. Betty: Not the tambourine, Noah, the trampoline. Noah: We have a trampoline? Betty: What’s the matter Noah? You look upset. Noah: It’s God. I just got all the animals packed in the Ark so they fit nicely and now God has added seven pairs of each kind of ritually clean animal and seven pairs of each kind of bird to the list. Betty: You mean he didn’t mention it before now? Betty: Well maybe you could just hose off some of the ones you already have. Noah: Either way, I’m afraid there won’t be room for any trampolines this trip, honey. After Noah had finally figured out a way to pack everything into the ark, the Lord shooed all the animals away from the door and slammed it shut. (Part of a zebra’s tail was still sticking out but the Lord just ignored it since there was no way he was ever going to get that door shut again.) Then the Lord gave the ark an almighty heave-ho and off they went! Ham: Dad can’t we open a window or something? The smell in here is gross! Noah: What’s that? I thought I saw your lips moving, son, but I can’t hear you over all the squawking, and the mooing and the bleating. Betty: I can’t stand all this sitting! I just know I’m putting on weight. What I wouldn’t give for that trampoline right now. Noah: What honey? Did you say something about a tambourine? Shem: I’m hungry! Hey I know! What’s say we barbecue one of the animals! 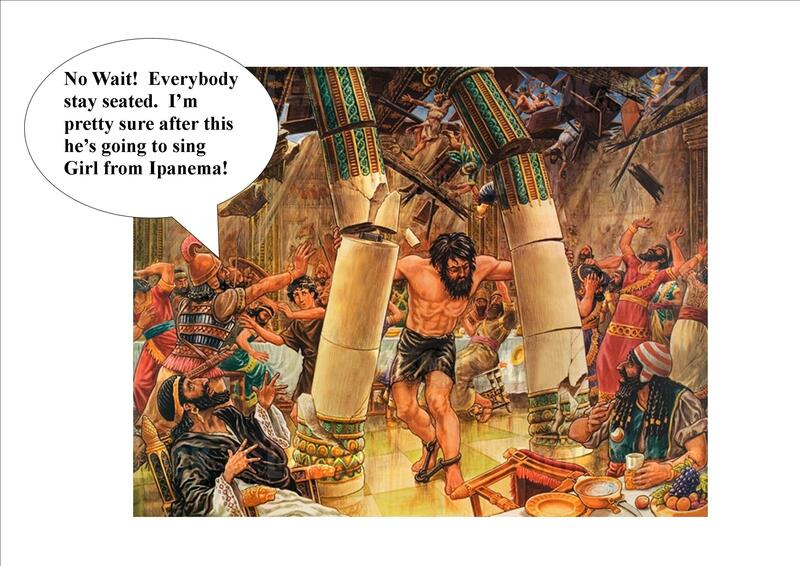 Japheth: Are we there yet? Everybody in unison: Ninety- nine potter vessels of wine on the ark, 99 pottery vessels of wine, take one down and pass it around 98 pottery vessels of wine on the ark . . .
Shem: Hey guess what everybody? We have officially risen 25 feet above the tops of the mountains! Ham: How do you know that? Shem: I measured it with this 25-foot flood dipstick Dad let me bring. Betty: Noah! How come you let Shem bring a 25-foot water dipstick, but you wouldn’t let me bring one lousy little trampoline? Noah: What’s that Betty? I can’t hear you over all the snorting and the squealing and the bow-wowing. Shem: Hey Dad a raven and a dove just got out and the raven didn’t come back but the dove did, and it had an olive branch in its beak! Noah: You know what, Shem, at this point Daddy doesn’t really give a rat’s behind. Ham: Ha ha! Funny you should say that, Dad, because there are several rats behind you right now! Noah: Hm . . . apparently some of us have been going forth and multiplying early. Ham: Hey Dad! Last time I looked outside there wasn’t any water anywhere, just dry land as far as the eye could see. Noah: What? When was this? Ham: About three months ago give or take. Noah: What? Why didn’t you tell me? Ham: I know how much you hate getting interrupted when you sing. And a hardy laugh was had by all. And there you have it, Dear Readers! 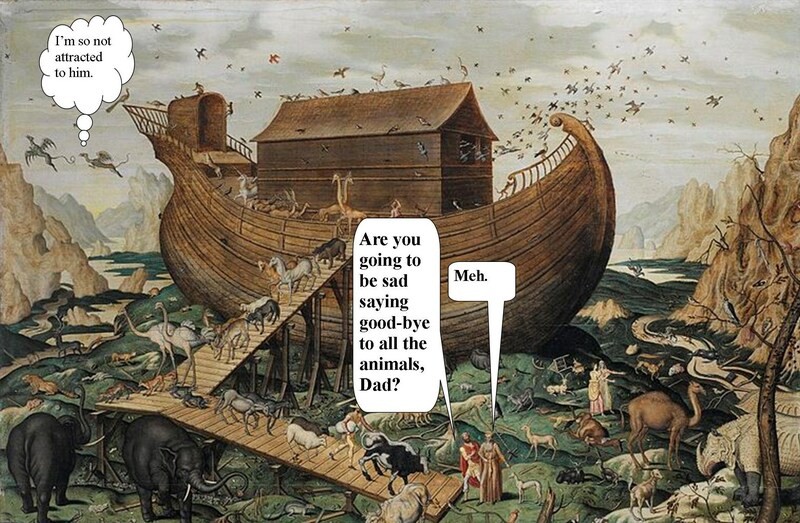 How Gregory imagines life on the ark during the Great Flood. Be sure and check back next week for the further adventures of Noah and the gang. Welcome Dear Readers to this week’s edition of Gregory’s Bible Stories. Every week Gregory goes to Sunday School and every week he comes home and tells about what he learned. This week Gregory learned about the first miracle that Jesus performed. 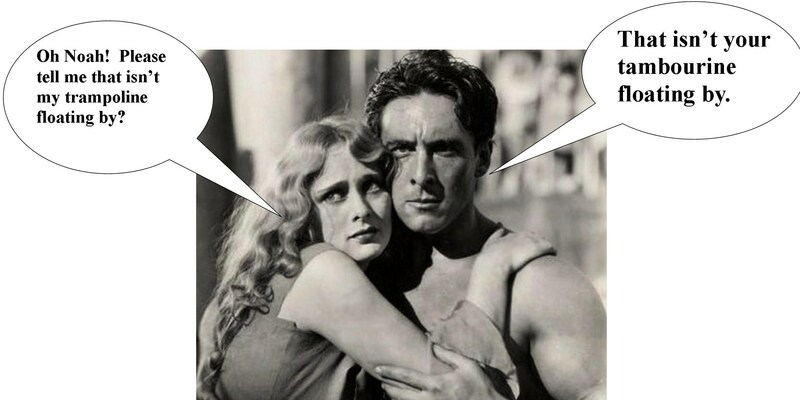 In biblical days, people were hard to get rid of. If you invited people over for dinner (which in those days was called a feast) they would stay way too long and totally wear out their welcome. Anyway, after the wedding everybody went over to the bridegroom’s house for some hardy feasting. There was wine and food and music and fun and wine. And just like today, if the wine runs out before the party is over, somebody has to do something about it. That’s exactly what happened. 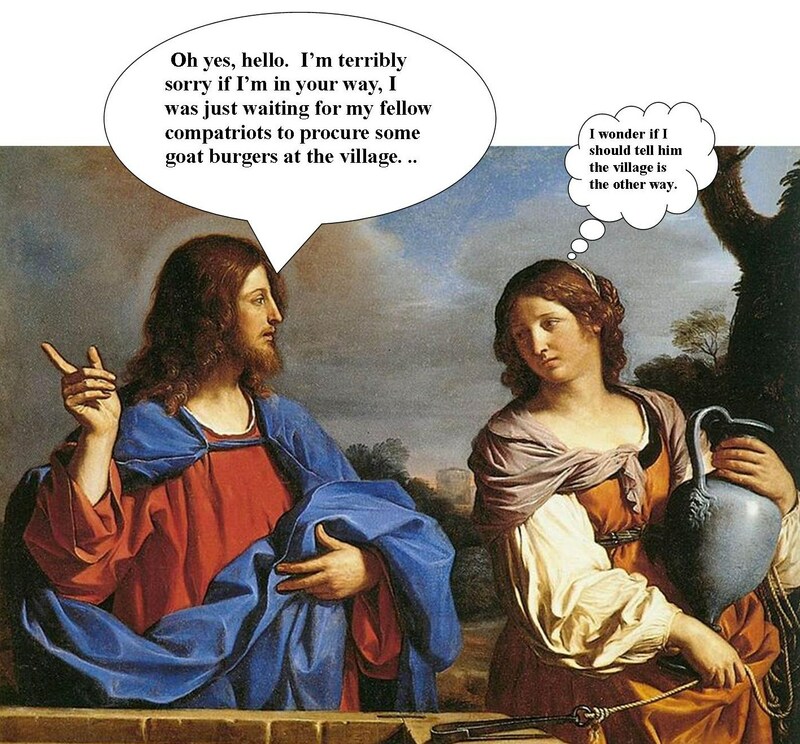 Just as Mary was going to refill her wine goblet, she overheard one of the servants talking about how the guests were complete lushes who had drunk everything in the house including the water in the fish bowl. “I will tell Jesus,” Mary assured the servants. Mary wove her way through the revelers and found Jesus who was just about to belt out a rousing rendition of Amazing Grace on the Karaoke machine (hand cranked). “They have no more wine.” Mary announced unceremoniously. Once Jesus was finished singing (he was the original crooner, it was such a pity I left my heart in San Francisco hadn’t been invented yet), he looked around and saw six water pots and told the servants to fill all six jars with water which they did. Which they also did and by the time the man put the water to his lips, it had turned into the best wine the man had ever gotten drunk on! 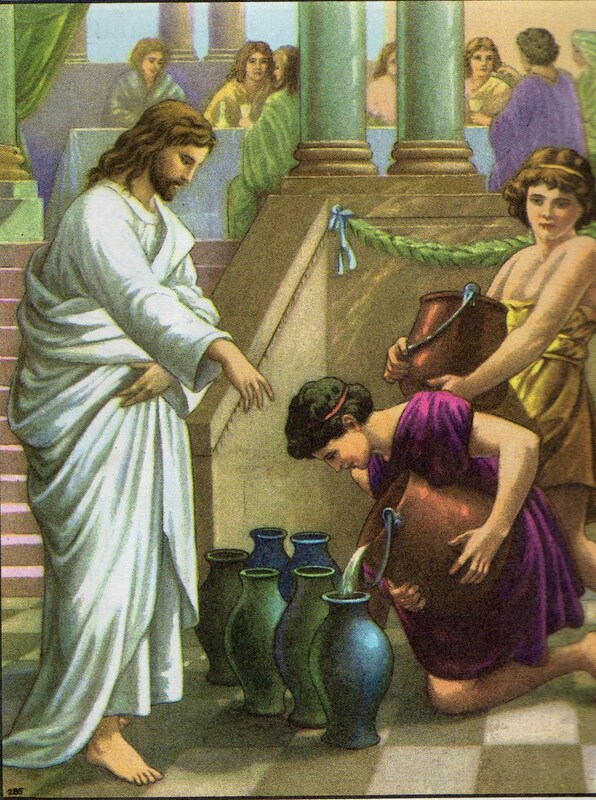 The man who was taking care of the feast did not know that Jesus had turned water into wine. The bridegroom did not know either. The bridegroom just assumed that the servants had found the stash of expensive wine he had taken great pains to hide before everybody arrived. But the servants knew and Mary knew that Jesus had performed his very first miracle. Jesus had turned water into wine, not bum wine either, but really, really, really good wine. Mary couldn’t have been prouder!